The United Kingdom has a wide variety of freshwater wetlands served by the plethora of rivers and streams that flow through the country. A great many rivers change their type as they flow to the sea and most if not all, have stretches flowing through some of Britains most scenic areas. Whether it be on boats, fishing or simply lazing on a riverbank quaffing a pint of ale,	'messing about on the River' has long been a favoured pastime of the British. Many of the	United Kingdoms' rivers are joined together by the Canal network allowing boats to navigate around the country. River in southern England; length 154 km / 96 miles. Sometimes known as the Upper Avon or Warwickshire Avon, it rises in the Northamptonshire uplands near Naseby and flows southwest through Warwick, Stratford-upon-Avon, and Evesham, before joining the River Severn near Tewkesbury, Gloucestershire. Bure River in Norfolk, England; length 80 km / 50 miles. It flows southeast through the Norfolk Broads, where it joins the River Yare at Yarmouth. Calder River in West Yorkshire, England; length 72 km / 45 miles It rises in the Pennine moors northwest of Todmorden, and joins the River Aire at Castleford. Several large reservoirs supplying water to West Yorkshire towns lie within its catchment area. The Aire and Calder Navigation forms a link in the system of rivers and canals that	provides a waterway from the River Mersey to the River Humber. The Calder valley, via Hebden Bridge, Sowerby Bridge, Mirfield, to Wakefield, is one of	the main road and rail routes through the Pennines. Calder River in Cumbria, England. It flows into the Irish Sea 16 km / 10 miles southeast of Whitehaven. Calder River in central Lancashire, England; length 24 km / 15 miles It joins the River Ribble near Whalley. Cam River in southeast England. It rises in Ashwell, Hertfordshire, and flows 65 km / 40 miles northwest and northeast through Cambridgeshire, and then into the River Ouse, 6 km / 4 miles south of Ely. The Cam is joined at Hauxton by the River Granta, which rises in Essex, and is known thereafter as either the Cam or the Granta. It is navigable as far as the city of Cambridge. Coquet River in Northumberland, England; length 64 km / 40 miles It rises in the Cheviot Hills, flows northeast, and enters the North Sea at Amble. Coquet Island lies just off the mouth of the river. Derwent River in North Yorkshire, northeast England; length 92 km / 57 miles. Rising in the North Yorkshire moors, it flows south through Malton and joins the River Ouse southeast of Selby. Dove River in Derbyshire, England, a tributary of the Trent; length 65 km / 40 miles. The Dove rises on Axe Edge, 6 km / 4 miles from Buxton, and forms the southwestern border between Derbyshire and Staffordshire as it flows south to join the Trent near Burton. The valley of Dovedale, below Hartington, where the river runs through a rocky, wooded gorge some 3 km / 2 miles long, is popular with walkers. Great Ouse River which rises near Brackley in Northamptonshire, central England, and flows eastwards through Buckinghamshire, Bedfordshire, Cambridgeshire, and Norfolk, before entering the Wash north of King's Lynn; length 250 km / 160 miles. A large sluice across the Great Ouse, near King's Lynn, was built as part of extensive flood-control works in 1959. The chief tributaries of the Great Ouse are the Ivel, Cam, Lark, Little Ouse, Wissey, and Nar, all of which come from the south or east. The	Bedfordshire Ouse was diverted in the 17th century from its devious course through Ely via two new channels called the New and Old Bedford rivers, 32 km / 20 miles long, running in a direct line from Earith near St Ives to Denver Sluice near Downham Market. Manifold River which flows through the Manifold Valley, a limestone gorge situated at the southern end of the Peak District in Staffordshire, England. For a distance of about 1.5	km / 1 miles the river disappears underground in swallow holes for part of the year. Mersey River in northwest England; length 112 km / 70 miles. Formed by the confluence of the	Goyt and Tame rivers at Stockport, it flows west through the south of Manchester, is joined by the Irwell at Flixton and by the Weaver at Runcorn, and enters the Irish Sea at Liverpool Bay. It drains large areas of the Lancashire and Cheshire plains. The Mersey is linked to the Manchester Ship Canal. Although plans were announced in 1990 to build a 1,800-m / 5,907-ft barrage across the Mersey estuary to generate electricity from tides, these were abandoned in 1992 for financial reasons. The river lies entirely below 45 m / 150 ft. It is artificially modified (as part of the	Manchester Ship Canal) as far as Warrington, where it becomes tidal. The Mersey is polluted by industrial waste, sewage, and chemicals. The Mersey became an artery of communications from the 18th century. Boats for passengers and goods used the river, with its major tributary the Irwell, between Liverpool and Manchester from 1720; the Bridgewater Canal acquired this traffic in the late 18th century. The Mersey had passenger services until the development of the railway in the middle of the 19th century. In the estuary (which has an area of over 78 sq km / 30 sq miles), steam ferries provided transport for commuters from the residential areas of Cheshire to Liverpool from 1815. In 1934 the first road tunnel under the Mersey was opened. 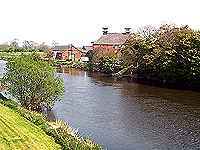 Until the 1920s the river formed the boundary between Lancashire and Cheshire. Nidd River in North Yorkshire, England, located within the Yorkshire Dales National Park. The river flows southeast from the base of Whernside (27 km / 17 miles northwest of Ripon) into the River Ouse near York. Water is supplied to Bradford from a dam above the village of Pateley Bridge. Upper Nidderdale is a designated area of outstanding natural beauty. Nith River of southern Scotland, rising in East Ayrshire unitary authority, about 13 km / 8 miles south of Cumnock, and flowing southeast for about 112 km / 70 miles through the valley of Nithsdale in Dumfries and Galloway unitary authority, before entering the Solway Firth 13 km / 8 miles south of Dumfries. Longest River in Britain, which rises on the slopes of Plynlimon, in Ceredigion, west Wales, and flows east and then south, finally forming a long estuary leading into the Bristol Channel; length 336 km / 208 miles. The Severn is navigable for 290 km / 180 miles, up to Welshpool (Trallwng) on the Welsh border. The	principal towns on its course are Shrewsbury, Worcester, and Gloucester. England and South Wales are linked by two road bridges and a railway tunnel crossing the Severn. A remarkable feature of the river is a tidal wave known as the `Severn Bore� that flows for some miles upstream and can reach a height of 2 m / 6 ft. The Severn rail tunnel was built in 1873-85. The first of the road bridges to be built opened in 1966, and carries the M4 motorway linking London and South Wales. A second road bridge was opened in 1996 and carries the M48 motorway. From its source, the Severn passes east through Powys and enters Shropshire near the Brythen Hills. Southeast of Shrewsbury, the river passes through Ironbridge Gorge, `cradle of the Industrial Revolution� and now a tourist attraction. Thereafter, it runs through Worcestershire and Gloucestershire, widening considerably after it passes Newnham. The	Severn is navigable by larger ships (of around 8,000 tonnes) as far as Sharpness, and by smaller vessels (up to 700 tonnes) to Gloucester, while barges of 350 tonnes capacity can negotiate its upper reaches as far as Stourport. The Severn is connected with the rivers Trent and Mersey via the Staffordshire and Worcestershire Canal. There is a canal network around Birmingham via the Worcester and Birmingham Canal, which joins the Severn at Worcester. Between Gloucester and Sharpness, the treacherous nature of the riverbed necessitated the construction, in 1827, of the 26 km / 16 mile long, lock-free Sharpness and Gloucester Ship Canal. Tributaries of the Severn include the Teme, Stour, Wye, Vyrnwy, Tern, and Avon; in total, the river basin covers an area of 11,420 sq km / 4,409 sq miles. Crossings Between 1873 and 1885, a rail tunnel was dug underneath the Severn near Chepstow, running for a distance of 7.2 km / 4.4 miles, from New Passage to Portskewett. This crossing greatly facilitated travel between Bristol and the Welsh capital Cardiff. A road suspension bridge was opened nearby, from Aust to Beachley, in 1966; this crossing carries the main M4 motorway linking London and South Wales and is subject to payment of a toll by users. Because of the increase in traffic volume, construction of a new road bridge was started in 1992 and completed five years later. Hydroelectric power in 1933, a committee recommended the construction of a hydroelectric power station on a river barrage at English Stones reef, which would utilize the tidal flow of the Severn. This plan, which was interrupted by World War II, was revived in 1945, when engineers confirmed the practicability of the scheme and projected an output of some 2,190,000,000 kWh. However, no tidal power plant has yet been built. Shannon Longest river in Ireland, rising 105 m / 344 ft above sea level in the Cuilcagh Mountains in County Cavan, and flowing 386 km / 240 miles to the Atlantic Ocean past Athlone, and through Loughs Allen, Boderg, Forbes, Ree, and Derg. The	estuary, which is 110 km / 68 miles long and 3-16 km / 3-10 wide, forms the northern boundary of County Limerick. The river is navigable as far as Limerick city, above which are the rapids of Doonas and Castletroy. The river is known for its salmon farms, Castleconnell being an important centre. It also has the first and largest hydroelectric	scheme in the Republic of Ireland (constructed 1925-29), with hydroelectric installations at and above Ardnacrusha, 5 km / 3 miles north of Limerick. Spey Second longest river in Scotland. It flows through Highland and Moray, rising 14 km / 8 miles southeast of Fort Augustus, for 172 km / 107 miles to the Moray Firth between Lossiemouth and Buckie. It has salmon fisheries at its mouth. The upper river augments the Lochaber hydroelectric scheme. Whisky is distilled in the Spey valley. Taf River in Carmarthenshire, southwest Wales, rising on the eastern side of the Preseli Hills and flowing through Carmarthenshire to Carmarthen Bay; length 50 km / 31 miles Commercial fisheries operate in Carmarthen Bay. The village of Laugharne lies at the mouth of the river. Tawe River in south Wales rising in the Black Mountain, south Powys, and flowing south to enter the Bristol Channel at Swansea; length 48 km / 30 miles. Tay Longest river in Scotland; length 193 km / 120 miles, it flows northeast through Loch Tay, then east and southeast past Perth to the Firth of Tay, crossed at Dundee by the Tay Bridge, before joining the North Sea. 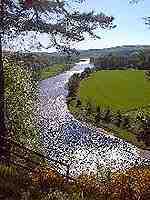 The Tay has salmon fisheries; its main tributaries are the Tummel, Isla, and Earn, Braan, and Almond. The drainage basin of the Tay and its tributaries forms one the most fully integrated hydroelectric developments in the north of Scotland. The first Tay Bridge, opened in 1878, on the then longest span over water in the world, was blown into the river in 1879, along with a train which was passing over it. The bridge was rebuilt in 1883-88, and a road bridge, from Newport-on-Tay to Dundee, was completed in 1966. Tees River flowing from the Pennines in Cumbria, northwest England, to the North Sea via Tees Bay, Middlesborough unitary authority, in northeast England; length 130 km / 80 miles. Its	port, Teesport, handles in excess of 42 million tonnes per annum, with port trade mainly chemical-related. Although much of the river nearing the sea is polluted with industrial waste, sewage, and chemicals, the Tees Barrage (opened in 1985, cost of construction �50 million) enables a 16 km / 10 mile stretch of the river to provide clean, non-tidal water. This is used for white - water sports, including canoeing. The Tees rises in the north Pennines at Tees Head, on the easterly reaches of Cross Fell, Cumbria, and flows southeast and then northeast through Stockton-on-Tees and Middlesbrough, entering the Tees Mouth estuary to join the North Sea. It is navigable to Middlesbrough. Its main tributaries are the Lune, Balder, and Greta. The river valley, known as Teesdale, includes Mickle Fell (790 m / 2,326 ft), the highest point in County Durham, and the waterfall of High Force. The Tees has a unique transporter bridge (a bridge consisting of a movable platform suspended from cables), opened in 1911, which has 49 m / 160 ft clearance above the water. Its central section transports cars and people across the Tees towards Hartepool. It is the sole working example in England. Teign River in Devon, southwest England; length 48 km / 30 miles. It rises on Dartmoor, west of Chagford, and flows east into the English Channel at Teignmouth. Its estuary is over 1 km / 0.6 miles wide. Teme The	river Teme is the second largest tributary of the River Severn. It rises in the Kerry hills in Mid Wales from a small spring in Bryn Coch quarry on Cilfaesty Hills at 460 metres above sea level. The Teme is a rural river flowing through unspoilt countryside which is regarded as some of the most attractive in Britain. The main town on the Teme is the historic border town of Ludlow in Shropshire. The Teme Valley, running down from Ludlow, comprises of the orchards, woods and countryside of Herefordshire and Worcestershire, to the foothills of the Malverns, the valley of the River Teme is an area of great beauty, interesting architecture, quiet places and rural pursuits. The rural nature of the river is reflected by high quality water with excellent brown trout and grayling fishing, with a challenge for the purist angler willing to accept the rugged conditions. Thames River in south England, flowing through London; length 338 km / 210 miles. The longest river in England, it rises in the Cotswold Hills above Cirencester and is tidal as far as Teddington. Below London there is protection from flooding by means of the Thames Barrier (1982). The headstreams unite at Lechlade. Tributaries from the north are the Windrush, Evenlode, Cherwell, Thame, Colne, Lea, and Roding; and from the south, the Kennet, Loddon, Wey, Mole, Darent, and Medway. Around Oxford the river is sometimes poetically called the Isis. The construction of a 11 km / 7 mile flood alleviation channel between Maidenhead and Eton was approved in 1994. At Gravesend, the head of the estuary, it has a width of 1 km / 0.6 miles, gradually increasing to 16 km / 10 miles at the Nore. Lying some 5 km / 3 miles southwest of the Nore is the mouth of the Medway estuary, at the head of which lie Chatham with important naval dockyards, Gillingham, and Rochester. Gravesend on the south bank of the river, some 40 km / 25 miles from the Nore, developed at a point where vessels used to await the turn of the tide. Tidal waters reach Teddington, 100 km / 62 miles from its mouth, where the first lock from the sea (except for the tidal lock at Richmond) is located. There are in all 47 locks, St John's Lock, Lechlade, being nearest the source. The	normal rise and fall of the tide is from 4.5 m / 15 ft to 7 m / 23 ft at London Bridge and from 4 m / 13 ft to 6 m / 20 ft at Tilbury. Until Tower Bridge was built, London Bridge was the lowest in the course; the reach between these two bridges is known as the `Pool of London. Tilbury, Fort and Docks, important as the main London container terminal, lies opposite Gravesend on the northern bank. At Woolwich, some 30 km / 19 miles above Tilbury, is the arsenal; Greenwich, a little farther upriver, has the Royal Naval College. Between Tilbury and London Bridge (some 40 km / 25 miles upstream) stretches the London dock System. The Thames has been frozen over at various times, the earliest recorded occasion being AD 1150. The embankments of the Thames in London were the work of Sir Joseph Bazalgette (1819-91), chief engineer of the Metropolitan Board of Works. The Albert Embankment on the south side was completed in 1869, the Victoria Embankment from Westminster to Blackfriars in 1870, and the Chelsea Embankment from the Royal Hospital to Battersea Bridge in 1874. In January 1949 work was started on a new embankment, designed by J Rawlinson, chief engineer of the former London County Council, on the south side from County Hall to Waterloo Bridge. These embankments were raised after 1974. There are walkways (formerly towpaths) from Teddington to Cricklade. The Port of London Authority is responsible for the control and conservation of the river below Teddington. Above Teddington the Environment Agency is the responsible authority; there is some barge traffic on this stretch of the river. The Thames is of great importance to the water supply of London, partly because the many springs in the chalk usually maintain a steady flow in summer. Salmon returned to the Thames in 1974. The river is spanned by 20 road and nine rail bridges between Hampton Court and the Tower of London. These include Tower Bridge (which has a drawbridge mechanism to enable large vessels to pass) and a suspension bridge at Hammersmith. The QEII Bridge opened in 1991 joins the counties of Essex and Kent. The chief tunnels under the Thames are the Thames Tunnel, completed by Brunel in 1841, now used by the East London Line of the London Underground; the Blackwall Tunnel (1897) from East India Dock Road to East Greenwich, the Rotherhithe Tunnel (1918) from Shadwell to Rotherhithe, and the Dartford tunnel completed in 1963. There are regular boats from Kingston to Folly Bridge, Oxford, during the summer. There is some beautiful scenery along this part of the river, for example at Cliveden, Cookham, Sonning, and Pangbourne. There are fine bridges at Richmond, Hampton Court, Chertsey, Maidenhead, and Shillingford. Henley, Wallingford, Dorchester, Abingdon, Eton and Windsor are attractive. The Royal Regatta at Henly on Thames is one of the highlights of the British social calander. Along the 80 km / 50 miles from its source beneath a tree in `Trewsbury Mead� to Oxford, the Thames glides through meadows, its course interrupted only by the small towns of Lechlade and Cricklade and the pretty stone-built hamlets of Kelmscott and Ashton Keynes. In these upper reaches there are two medieval bridges New Bridge and Radcot Bridge. Motor launches can reach Lechlade; beyond that point it is possible to canoe up to Cricklade, but the final 16 km / 10 miles to the source of the Thames is best done on foot. One particularly attractive section is the steep-sided valley through the chalk hills between Goring and Reading, known as the Goring Gap. Trent Third longest river of England; length 275 km / 170 miles. Rising in the south Pennines (at Norton in the Moors) by the Staffordshire-Cheshire border, it flows south and then northeast through Derbyshire, along the county boundary of Leicestershire, and through Nottinghamshire and Lincolnshire, joining the Ouse east of Goole to form the Humber estuary, and entering the North Sea below Spurn Head. Its drainage basin covers more than 10,000 sq km / 4,000 sq miles. Main tributaries are the Churnet, Dove, and Derwent. It is navigable by barge for nearly 160 km / 100 miles. The principal towns and cities along its course are Burton upon Trent, Stoke-on-Trent, Nottingham, and Newark. It is connected with other rivers and with the Birmingham and Lancashire districts by the Trent and Mersey Canal and the Grand Union Canal. The Trent valley includes extensive gravel workings and many electric power stations. 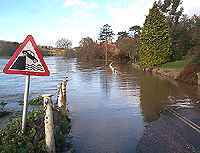 Tweed River rising in the Tweedsmuir Hills, 10 km / 6 miles north of Moffat, southwest Scottish Borders, Scotland, and entering the North Sea at Berwick-upon-Tweed, Northumberland; length 156 km / 97 miles. It flows in a northeasterly direction, and from Coldstream until near Berwick-upon-Tweed it forms the border between England and Scotland. It is the fourth longest river in Scotland and is one of the best salmon rivers. Tyne River of northeast England formed by the union of the North Tyne (rising in the Cheviot Hills) and South Tyne (rising near Cross Fell in Cumbria) near Hexham, Northumberland, and reaching the North Sea at Tynemouth ; length 72 km / 45 miles. Kielder Water (1980) in the North Tyne Valley is Europe's largest artificial lake, 12 km / 7.5 miles long and 0.8 km / 0.5 miles wide, and supplies the industries of Tyneside, Wearside, and Teesside. As well as functioning as a reservoir, it is a major resource for recreational use. 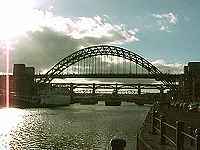 The principal tributary of the Tyne is the River Derwent, and the chief towns and cities along its course are Newcastle upon Tyne, Gateshead, Jarrow, and South Shields. Much of the Tyne basin lies within the Northumberland National Park. Along the lower reaches the Tyneside conurbation developed in the 19th century around shipyards, iron works, and chemical industries. Tywi or Towy River in Carmarthenshire, southwest Wales; length 108 km / 68 miles. It rises in the Cambrian Mountains of central Wales and flows southwest through Carmarthen before entering Carmarthen Bay. Ure River in North Yorkshire, northern England; length about 80 km / 50 miles. It rises 10 km / 6 miles northwest of Hawes, near the borders of Cumbria, and joins the River Swale near Boroughbridge to form the Ouse. Flowing through the spectacular Wensleydale countryside, the river drops dramatically at Aysgarth. Aysgarth Force is located alongside the A684 where a beautiful old single arched bridge spans the river close by. Wear River in northeast England; length 107 km / 67 miles. From its source near Wearhead in the Pennines in County Durham, it flows eastwards along a narrow valley, Weardale, to Bishop Auckland and then northeast past Durham and Chester-le-Street, to meet the North Sea at Sunderland. Weardale is moorland in its upper reaches at Stanhope and Wolsingham. At Sunderland the Wear cuts a gorge 30 m / 98 ft deep through the local magnesian limestone plateau to reach the North Sea. The city of Durham is built along the Wear, and its castle and cathedral (a World Heritage site) stand 30 m / 100 ft above the river on an incised meander. River in Wales and England; length 208 km / 130 miles. It rises on Plynlimon in northeast Ceredigion, flows southeast and east through Powys and Hereford and Worcester, and follows the Gwent-Gloucestershire border before joining the river Severn 4 km / 2.5 miles south of Chepstow. 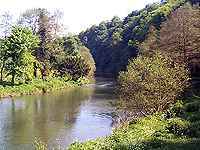 It has salmon fisheries and is noted for its scenery particularly at Symonds Yat. Wye River of central England; length 15 km / 9 miles. It rises in the Chiltern Hills in Buckinghamshire and flows in a southeasterly direction to Bourne End where it meets the Thames. Wye River in Derbyshire, central England; length 32 km / 20 miles. It rises near Buxton and flows in a southeasterly direction to meet the Derwent at Rowsley.